A little while back we had the sheer pleasure of rolling out our “Digital Makeovers” activity for the lovely people at O2 Business. Rather than telling people about the wonders of embracing mobile technology as a small business, we decided that it would be rather more effective to show those splendours. So we made over an ice cream van. Naturally. Well this year we were asked to scale the whole thing up. So rather than merely making over a small business, we’re making over a whole town-ful of them. 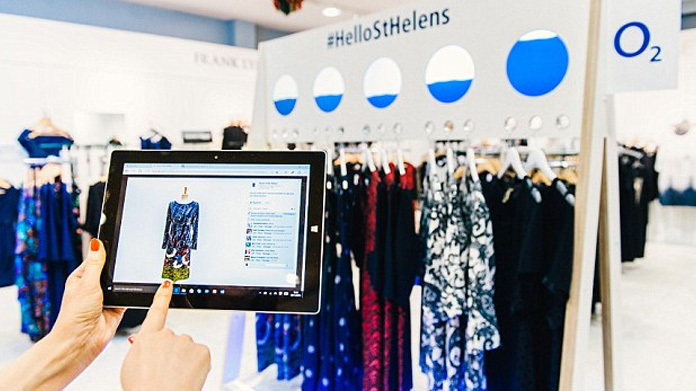 We’ve hooked up with the good people – and small businesses – of St Helens to create a conceptual Digital High Street. We’re taking digital makeovers to a grand scale with over 60 high street stores and companies getting the O2 treatment. This week, we announced the first of those experiments as we launched a Digital Clothes Rail with department store, Tyrers. Dubbed the “No Likey, No Lighty Rail”, a feed from social channels direct to the rail enabled shoppers to see what those on the internet thought of each of the items based on the number of Likes each received on O2 and Tyrers’ Facebook feeds. News of the development went far and wide, with print and online pieces across the national titles (including the Daily Mirror and Daily Mail). We scored some lovely regional coverage with the St Helens Reporter, St Helens Star and Liverpool Echo all “liking” the story. Meantime, the tech titles picked it up too, with coverage with the lovely people at PSFK and BT.com amongst others. Oh, and of course we made across the B2B titles too as titles including TelecomPaper, Internet Retailing and Retail Systems gave us a lovely show. For those who might be interested, there’s a little film of the whole thing below. And of course there are plenty more makeovers to come!